Usually it is just a hackneyed figure of speech when we say that a city has a heart. But Copenhagen and Nørrebro actually have one. On a pedestal at Aksel Larsens Plads near Nørrebro Parken and directly opposite The Red Square there is a big red iron heart — Nørrebros Hjerte. It is engraved with the words ‘We want to live together’ in many languages. If you look closely at the heart, you will realize that it is made out of pieces of metal from different kinds of weapons. 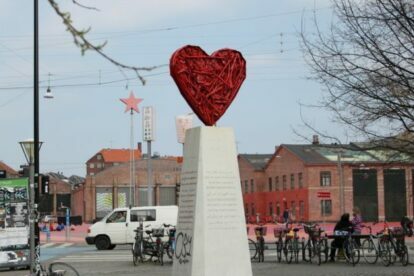 Nørrebro has had its trouble in the past, and the heart stands as a symbol of the joint effort and desire to live peacefully and respectfully together. All the weapons used to make the sculpture have been either confiscated or submitted voluntarily to the Nørrebro police. The artist himself, Bjørn Nørgaard, was born in Nørrebro not too far from where the heart is located. There are plenty of benches in the immediate vicinity of The Heart, so sit down and take a little break to enjoy this unusual sculpture.